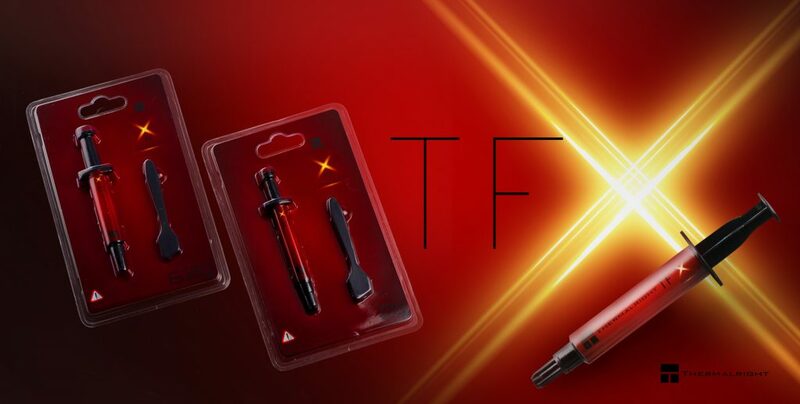 THERMALRIGHT’s new TF series of thermal compound was developed to fulfill the demanding needs our extreme cooling community have come to expect from us. 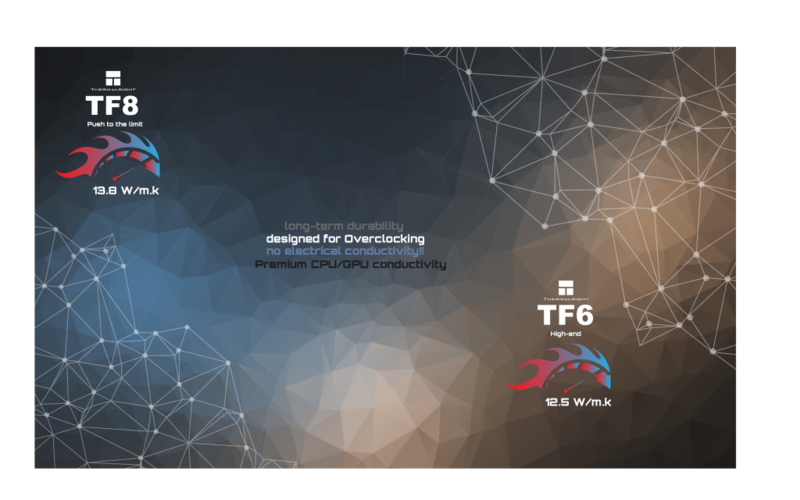 With our line of extreme coolers and TF series thermal compound our overclocking community has even more cooling ability now in their hands. We made TF series no conductive so our users don’t have to worry about shorts. 4 steps to install AMD Ryzen AM4 THERMALRIGHT Mounting Kit. Thermalright is now announcing “Narrow ILM / AMD Bolt-Thru-Kit ” makes all Thermalright CPU coolers compatible with Intel’s Narrow ILM processor/AMD processor. (Except AM4 not compatible) Narrow ILM / AMD Bolt-Thru-Kit can be install the cooler rotated by 90° in order to allow for an optimal positioning of the cooler and to evade compatibility issues of the heatsink on the Narrow ILM / AMD processor. Narrow ILM / AMD Bolt-Thru-Kit designed to combine outstanding reliability, optimal contact pressure and easy, straightforward installation, Multi-Platform System is an enthusiast-upgrade. Now Thermalright AXP H series increase the heights of heat pipe for ASUS Maximus VIII IMPACT and GIGABYTE GA-Z170N-WIFI Motherboard. And now you can mount system makes it possible to install the cooler rotated by 90° in order to allow for an optimal positioning of the cooler and to evade compatibility issues on ASUS Maximus VIII IMPACT and GIGABYTE GA-Z170N-WIFI Motherboard. This is what we do for you to thermal right on any motherboards. The package also included our most superior popular Thermalright Chill Factor thermal paste. Please read and pay close attention to the instructions in how to apply thermal paste. The first HDT cooler, Thermalright TS releases the immediate innovative again. In General “pea” does not meet our HDT base design work. Continuing on with the HR series of coolers that started way back in 2005 and has evolved into the Macho coolers, Thermalright now adds the Macho Direct HDT (Direct Heatpipe Direct Touch) CPU-Cooler. With the Macho Direct we have taken the well-known HR-02 / Macho design to a new level, giving price conscious users great cooling on a budget. This silence optimized cooler using the TY-140 Black fan (from the TY-140 series of time proven fans) offers exceptional cooling performance at an attractive price. The original concepts of the Macho have been maintained. The heat sink is aligned to the rear of the PC case to ensure that even ram modules with high-rising heat spreaders will fit. The aluminum cooling fins use our proven design to counteract air accumulation between the cooling fins. The Macho Direct makes use of the Heatpipe Direct Touch principle. Five high-performance 6 mm heatpipes provide efficient dissipation of processor heat. The bottoms of the heatpipes use our proven convex form. The patented convex shape of the heatpipe contact surface combined with the heatpipes setting slightly below the cooler base gives the Macho Direct outstanding cooling performance. The HDT heatpipes setting lower means the Macho Direct is 4 mm shorter in height than other Machos. This allows it to fit into cases where the “normal” Macho is too tall. The proven design of Macho aluminum fins allows very low airflow resistance. The additional perforation of the cooling fins helps eliminate heat buildup between the individual fins increasing efficiency and reducing temperatures. The included TY-140 Black (PWM) fan is optimized for the Macho Direct. With an idle speed of 300 rpm with 16.9 cfm and a top speed of 1,300 rpm with 73.6 cfm, the fan moves lots of air and runs exceptionally quiet, even at higher speeds. The TY-140 Black uses our proven low-wear “Enhanced Hyper-Flow Bearing”. This proven design combines the features of conventional 120 mm fan mounting points with the larger fan diameter of conventional 140 mm fans. The fan is fitted securely to the heatsink with the included, revised fan brackets with specially designed anti-vibration pads to give unsurpassed performance. The universal mounting kit included with the Macho Direct supports all current Intel- and AMD sockets (Intel LGA1156/1155/2011/1150/2011-3/1151 and AMD AM2/AM2+/AM3/FM1/FM2/FM2+). Also included in the package is our popular Thermalright magnetic tip Screwdriver and our excellent Thermalright Chill Factor thermal paste. Please read and closely follow the instructions in the manual on how to apply the thermal paste. The Thermalright show innovation again with release of its first HDT cooler, Macho Direct. usual “pea” method does not work with our HDT base design.